Life and Leisure in Beaumont, Texas. The word “loafer” has a couple of definitions. The first is a way of passing time, loafing around without a lot to do. The second is a type of shoe. In Beaumont one often does the former and usually wears the latter. That’s because Beaumont is a typical southern city with hot, lazy summers and mild winters that almost require killing time on a porch or in a park at least a month or two every year. Beaumont has over half a dozen major city parks begging loafers of the human kind to come, walk, let kids run, and picnic or fly a kite if wind and want to is just right. Riverfront Park on the Neches is a great place to watch ships, picnic or, well, just loaf. Central park near Hermann Memorial has a really totally cool play area for kids and enough lawn for parents to find a shade on and just watch the little ones have fun. When watching dragon flies dash at flowers gets boring that pair of comfortable shoes and a bit of gas are about all that’s required to spice up a day of any time of year. There’s something to do in most every direction in Beaumont. Choices are as diverse as directions, too. It all then becomes a matter of time and tastes. Beaumont has more than half a dozen museums for those who like to think and look. 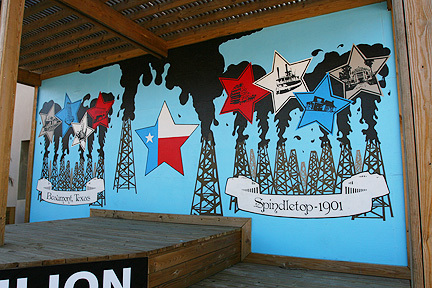 Spindletop, an unlikely name for one of the richest oil finds on the planet, is home to the Gladys City Boomtown Museum, Beaumont’s tribute to its oil strike past. The museum lies just off U.S. 69 on the campus of Lamar University. There’s a nominal fee for visiting the museum, which opens up visitors to a world of history and a story of Texas’ past well worth the expense and considerably more. Youngsters who visit the Fire Museum oddly contradict the subject of this popular and “Official Fire Museum of Texas” when they utter the word “cool” at every stop. From hot and cool to bright and witty, the historic Travis Street Substation houses the Edison Museum, dedicated to Thomas Alva Edison and all his wonderful inventions, including the incandescent light! 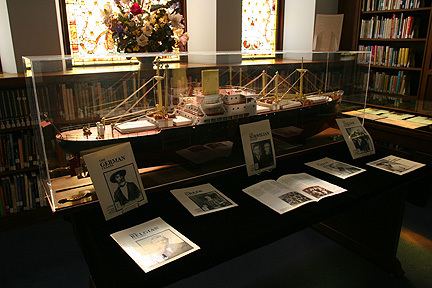 There are a few other museums in Beaumont worth the trek, including the Police Museum, a tribute to local golfing great Babe Didrikson, the Energy Museum, Clifton Steamboat Museum, and the Art Museum of Southeast Texas. Enough museums to wear out a pair of shoes on a weekend! Gator Rescue, a short drive out of town on FM 365. Gator Rescue offers much more kid-friendly excitement. It’s the home of CMT’s Gary Saurage of Gator 911 and the home of Big Al, largest captive gator in Texas. For parents who’s looking for less bite there’s local kid haunts like Adventure Kingdom, Bounce Zone and Fun City. A good compromise but one with a bit more bite on the pocket book might be a ride on The Cardinal, an open air pontoon boat that cruises the wilds of the Neches. It runs most of the year on weekends. Nature activities are sometimes a wild but fun way to fill up a day. Besides a ride on The Cardinal or snapping over to Gator Rescue, Beaumont has a couple more leaves up its sleeve. 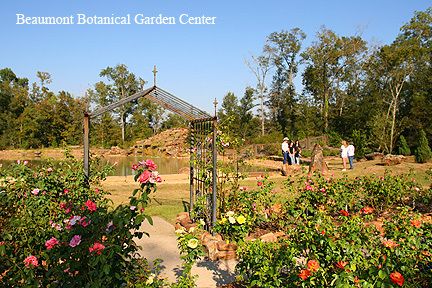 In town there’s the Beaumont Botanical Garden Center. It’s the place to learn about local flora and fauna, sniff around in a lovely rose garden or have a moment to reflect in a Japanese garden. Up U.S. 69 towards the Pineywoods of Texas is the Big Thicket National Preserve. The preserve is an understated destination if ever there was one. The visitor center is big and fun, all about the last wilderness in Texas. Of course Southeast Texans like to kick up those heals rather than trundling around on them sometimes. 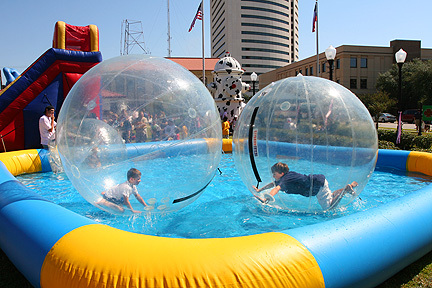 Throughout the year there are fairs and festivals that offer such opportunities. The South Texas State Fair is the biggest, a springtime event that combines all the fun of a fair, a midway and a rodeo, all in one. Another fun and frolic springtime event is the Neches River Festival, part pageant, part festival, part Medieval merriment. Another colorful edition to Beaumont festival schedule is the Kaleidoscope Arts and Crafts Festival held in May, an artistic beginning to summer in Southeast Texas. For some people, parents with sitters, couples or singles, night life is the right life. When the sun goes down the fun comes up on a downtown street called Crockett. Beumont’s miniature version of Austin’s famed Sixth Street is no small thing. Fine dining begins at the Spindletop Steakhouse, Pancho Villa Mexican Kitchen or the canjun flavored Zydeco Diner. The fun continues at the Star Bar, Dixie Dance Hall, The Hub or one or two other clubs, depending upon musical tastes. On Crockett Street there’s no river boats or snapping gators but there’s plenty of snap and splash to keep grownups awake long after school night bed time! Dining, shopping, museums, nature and adventure, it’s all just like any city but it’s all just different and interesting enough to make Beaumont a worthy destination or an interesting hometown. Beaumont, a town at the crossroads and gateway city, has all the fun and flavors of Texas. Just bring sunscreen, wear a hat and keep an eye on the weather, especially when the season’s ripe for big winds from the south or a blue norther, two typically Texas events that’ll put a chill in outdoor plans or just blow them right away. When the wind is right, pretty much day or night, Beaumont ain’t a bad place to be! What’s in a name? There doesn’t seem to be much agreement about how Beaumont got its moniker. Local historical sources say the city was named by Henry Millard either for his deceased wife’s family, for her in particular or for her father. Amusingly and erroneously realestate.com suggests the name comes from the French words “beautiful (beau) hill (mont).” Beaumont sits on flat coastal plains! Goes to show what “foreigners” know! 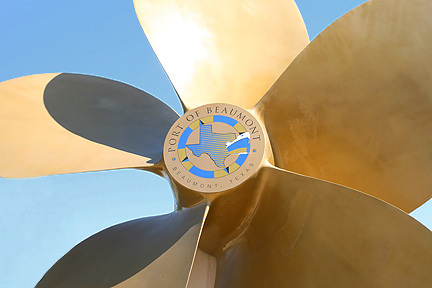 Born during the days of the Republic, Beaumont, Texas has been a major city and port for close to two hundred years. It has lived through every boom and bust cycle Texas ever had. The city’s strategic location at the southeast corner of Texas has always made Beaumont an entry and exit point for goods in the Lone Star State. Far less raucous or braggadocios than younger seaport cities further along Texas’ coast Beaumont has grown steadily and clung firmly to time and tradition. Every major Texas industry has had a presence in Beaumont, from timber and cattle to rice and oil. The timber boom, Spindletop, and the world wars shaped the city’s future more than most other events. Spindletop was the home-grown oil boom that turned out to be the biggest boon to Beaumont, Texas, and the U.S. ever in history.Shipping, railroads, and highway transportation fan out from the city, forming a spider web upon which millions of tons and billions of dollars worth of goods move every year. Beaumont lies along the west bank of the Neches river, an important waterway since before the Republic. Today the lower end of the Neches forms part of the Port of Beaumont, one of the largest ports in the U.S..
Only three other seaports in America move more tonnage than the Port of Beaumont. The Port is the second largest military seaport in the world. The Neches connects Beaumont’s port with the Gulf while the Intra-Coastal Canal links it with the Mississippi, allowing barges to move from Beaumont to America’s Midwest all the way to Chicago without ever traversing ocean water. Railroads are no less important to Beaumont. Rails not only carry every imaginable cargo to and from the port but move it along and from the system of rails that traverse the gulf coast a few miles north of the Intra-Coastal. Interstate 10 passes through Beaumont and intersects with U.S. Highways 69, 96 and 287, forming the last major connections linking Texas, Beaumont, and the world. Beaumont’s location is responsible for its distinctive characteristics, from demographics to weather. Demographically speaking Beaumont is younger, lower income and heavily African American and Hispanic. Beaumont’s climate is typical Texas coastal, mild winters and hot summers tempered by Gulf winds that sometimes rise to a fury pitch. Beaumont has suffered more than its share of difficulties, including hurricanes. It has fared relatively well, however, better than the other two points of the “Golden Triangle,” a name given the southeast Texas area during the days of the black-gold oil boom. No Gulf coastal city is immune from the big winds but Beaumont is far enough inland and rooted securely enough that it can weather a considerable storm and recover quickly. Economically Beaumont has had a difficult time these days but it still remains a vibrant city by regional and Texas standards. 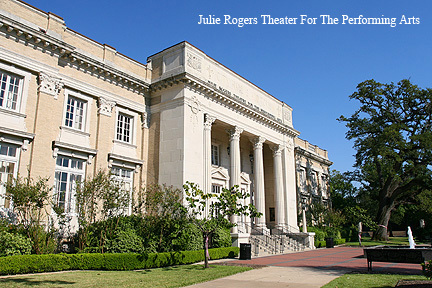 Beaumont is an exceptionally typical city for East Texas. It is a major employment center for a large rural population coming from southeast Texas and southwest Louisiana. It’s where many younger families and parents migrate to in order to find work as their rural communities offer little opportunity. For a city of just over a hundred thousand Beaumont actually provides a wide spectrum of services for residents. The city has three major hospitals including Christus St. Elizabeth and Memorial Herman Baptist which combined provide more jobs than any other employers in the city. The single largest employer in Beaumont is the Beaumont Independent School District, a fact reflecting Beaumont’s large young population. Lamar University, the sixth largest employer, provides a diversity of educational opportunities. The state university’s faculty and staff, numbering over a thousand, serve 15,000 full and part-time students. The college offers more than a hundred degrees in five major schools: Engineering, Education, Human Development, Business, and the Arts. A full spectrum of athletic opportunities, typical of a state university, are available on the campus. Beaumont’s location is also responsible for making it a major shopping, retail and dining hub in southeast Texas. The largest retail district is located along the U.S. 69/96/287 corridor north of the I10 interchange. Parkdale Mall anchors an impressive collection of shopping centers and major retailers. Another primary shopping area is located around Gateway Shopping Center on I10 in the heart of the city. Everything from casual dining to fast food, high class or local cuisine is served up in restaurants along the freeway corridors and in the downtown entertainment district. Lifestyles in Beaumont reflect the city’s land-meets-sea and country meets town aura. The people of Beaumont are a bit more rowdy and a bit more religious than some parts of the state, a contradiction that makes more sense to southerners and East Texans than to folks elsewhere. Days move slowly and methodically. On weekends families drift to local parks where kids run and play and parents relax between moments when they’re not corralling the herd or keeping the peace. Central Park, between the Baptist hospital and 4, has an amazing play area. There are other parks throughout the city. Nightlife in Beaumont strolls the sidewalks of Crockett Street. Rock, country, blues, jazz and a bit of zydeco drift from clubs along the historic avenue. Several restaurants like Spindeltop Steakhouse and Pancho Villa’s Mexican Kitchen provide dining opportunities for the party set. School and college athletics, movie theaters and arcades, an occasional festival or trips down to the beach or over to Houston complete leisure activities for most citizens of Beaumont. Beaumont is home town to the biggest U.S. oil companies including Gulf, which is now Chevron, and Humble and Magnolia Petroleum, now part of the ExxonMobil Corporation. These companies grew out of the Spindeltop oil strike. A museum paying tribute to boom times now resides where oil derricks once cluttered the skyline. A number of other museums in Beaumont pay tribute to the city’s past or celebrate the arts and culture. Notable attractions are the Art Museum of Southeast Texas, the Edison Museum recognizing Thomas Edison, and the Fire Museum of Texas. One of the reasons Beaumont has fared better than some cities is the diversity of employment opportunities. Schools and hospitals, along with Beaumont’s retail and hospitality industry, provide jobs for many thousands of households. Construction and the Port are major employers too, forming the base of Beaumont’s blue collar economy. Many southeast Texans commute from outlying areas into the city for work. The drive from pine forested rural areas takes on average about twenty minutes. Within the city there about fifty thousand single-family homes with a median price for a home in the $60 thousands. Around a fourth of those houses are rentals. Average rental rates hover over $600 with a vacancy rate of just under ten percent at last count. Construction of single-family houses has gone down in the city as it has in most other areas of the U.S., but multi-family housing continues to grow. Beaumont’s housing authority has a major project underway to replace older low-income units while across the city other projects for the city’s large younger and more mobile population are still underway. Beaumont is not as big, slick, fancy or popular as some Texas cities. It’s importance to the state cannot be underestimated, however. Not only is its port vital to the state and national economy but it also, as mentioned, serves the state in a lot of other ways from being a regional retail hub to a major employer. The city’s contribution to Texas history is not rivaled by any other metropolitan area. Residents of the north western corner of the Golden Triangle are a proud, determined people. It’s a Texas town with strong Southern roots and a spicy Cajun flavor. Beaumont is all Texas. It’s a place where more than a hundred thousand Texans are quite proud and happy to hang their hat and call home. This museum offers the area's most esteemed artwork, interactive features and family-friendly experiences. Stop for lunch at Two Magnolias or participate in family Arts Day events offered four times a year. BABE DIDRIKSON ZAHARIAS MEMORIAL MUSEUM 1750 IH-10 E, Beaumont, TX 77704 409-833-4622, The museum documents the multitude of awards, records and achievements throughout the life of the region's hometown legend, world's greatest female athlete and Olympic gold-medalist, Mildred Babe Didrikson Zaharias. BEAUMONT BOTANICAL GARDENS 6088 Babe Zaharias Dr.,Beaumont, TX 77705 409-842-3135, A sanctuary of flora in the eastern end of the city, the Beaumont Botanical Gardens offers visitors a Horticulture Center, a Native Plant Center, a Japanese garden, a modern rose garden and a 9/11 Memorial Garden. THE CHAMBERS HOUSE MUSEUM, 2240 Calder Ave. Beaumont, TX 77`!Ol, 409-832-4010, Built in 1906, the house was recently restored to interpret the years between 1920 and 1945. The Chambers House has all of the original family furniture and artifacts and tells an intriguing and delightful story of this middle-class Beaumont family. DISHMAN ART MUSEUM, Lamar University Beaumont, TX 71705, 409-880-8959, Opened on the campus of Lamar University in 1983, the Dishman Art Museum serves as a teaching facility, offering students an opportunity to experience diverse styles that reflect international trends as well as exhibit their own work. EDISON MUSEUM, 350 Pine St. at Edison Plaza, Beaumont, TX 77701, 409-981-3089, Through exhibits and displays of artifacts, the museum communicates the contributions of the electrical industry that resulted from the genius of Thomas Alva Edison. 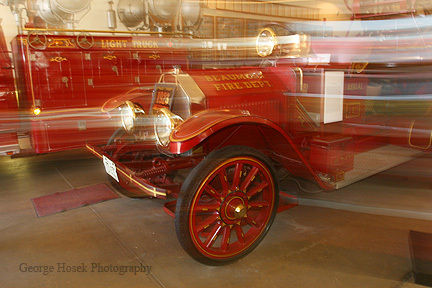 FIRE MUSEUM OF TEXAS, 400 Walnut St., Beaumont, TX 71101 409-880-3927, Open since 1984, this tribute to firefighters houses a collection of antique engines and firefighting equipment dating back to the 1800s. Take your picture in front of the original World's Largest Fire Hydrant. GATOR COUNTRY ADVENTURE PARK Located west of Beaumont on N-10 at exit 838 (FM 365) Beaumont, TX 71705, 409-794-9453, Gator Country provides a chance for all visitors to feed and have a handson interaction with live alligators. The adventure park is home to more than 130 American Alligators, 6 species of crocodiles and caiman, and many other reptiles. JOHN JAY FRENCH HOUSE MUSEUM, 3025 French Rd., Beaurriont, TX 71106, 409-898-0348, The John Jay French house, built in 1845, is one of the oldest surviving houses in Beaumont. It is also one of the first houses in Beaumont built with two stories, using milled lumber. The John Jay French Museum demonstrates the life of a prosperous Texas pioneer family from 1845-1865. The historic pioneer settlement, built by John Jay French, tanner and merchant, is filled with antique furnishings, clothing and pioneer household utensils. MCFADDIN-WARD HOUSE MUSEUM, 1906 Calder Ave., Beaumont, TX 77701, 409-832-2134, The stately McFaddin-Ward House was built in 1906 in the Beaux-Arts Colonial style. The building and its furnishings reflect the lifestyle of the prominent family who lived in the house for 75 years. SPINDLETOP-GLADYS CITY BOOMTOWN MUSEUM Hwy. 69 at University Dr. (On the campus of Lamar University), Beaumont, TX 11710 409-835-0823, Beaumont's early claim to fame - the Spindletop Gusher - is authenticated in this period museum and replica of the early oil-rush town. See the world's only working replica gusher, a general store, a dry goods store, a log cabin saloon and a barbershop, among other old buildings. ST. ANTHONY CATHEDRAL BASILICA, 700 Jefferson St., Beaumont, TX 77701, 409-833-6433, Built over 100 years ago, St. Anthony's is one of the most resplendent houses of worship in the southwestern United States. In 2006, Pope Benedict XVI elevated the church to a honored title of Cathedral Basilica, recognizing the historic, artistic and religious significance of the site. TEXAS ENERGY MUSEUM, 600 Main St., Beaumont, TX 77701, 409-833-5100, This is the definitive exhibit on the Texas oil industry: Unlocking the energy of oil! See cinematic robots depict three generations of an oil-field family. Historical characters share the captivating story of the Spindletop gusher that blew and started the petrochemical age in 1901. TYRRELL HISTORICAL LIBRARY 695 Pearl St., Beaumont 409-833-2759, Capt. W. C. Tyrrell purchased the First Baptist Church in 1923 and donated the building for library purposes to the City of Beaumont. The church was built in 1903 in a modified Gothic style of architecture with rough gray stone and beautiful stained-glass windows. It is the main genealogical library in Southeast Texas and the archives focus on this region.